The JUUL couldn’t be simpler to use: place a pod in the battery and vape when you want. There are no buttons or complicated menu to navigate. Just take a hit when you want. It’s ready when you are. Once your pod is empty, remove it and replace it with a new one. Smokers will appreciate the simplicity. The JUUL is an unassuming device. What sets it apart from other similarly sized devices is its innovative technology and performance. The tech in the JUUL works well! I’ve tried dozens of similar pod vapes but the performance of the JUUL is in a league of its own. The JUUL uses automatic temperature control, a feature typically found in bulky vape mods with complicated settings. Because of temperature control, JUUL does not produce burnt hitslike some of its competition. 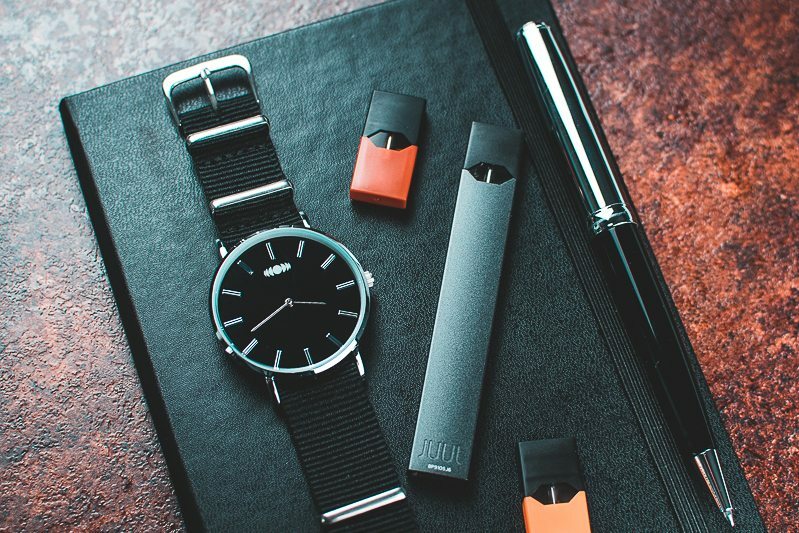 The JUUL uses nicotine salt-based eliquid  in its pods. This “salt,” in chemical terms means the nicotine has a positive and negative charged ion which smooths out the harsh nicotine taste found in similar-looking devices. That said, you will feel it when you hit it! JUUL closely mimics the feeling of smoking — most other vape products have failed to replicate that sensation. The perfect draw (inhale) on a vape comes down to preference. The JUUL provides what is known as a mouth-to-lung (MTL) draw and it’s a fairly tight one at that. This draw is similar to that of a cigarette in that you inhale first into your mouth before taking it to the lungs. This is the most familiar and comfortable draw to transition from smoking to vaping. The JUUL is really lightweight, weighing about the same as a typical ink pen. It’s just over 14 grams with a pod installed. Fully assembled, it’s just over 9.5 cm in length and 1.5 cm wide. A cigarette is 8.3 cm in length, making the JUUL marginally larger. The small size and light weight will be in line with what smokers are accustomed to. The JUUL is also discreet while in use. That makes it optimal for those that don’t want to draw attention to themselves. 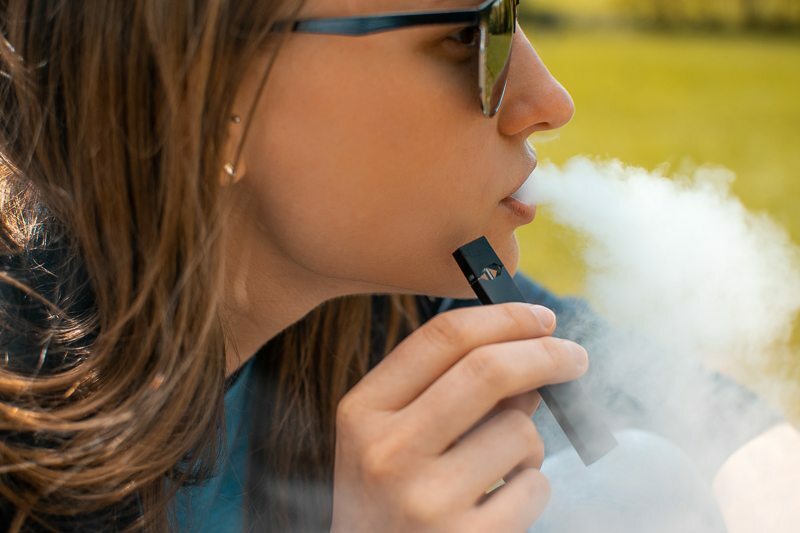 This lends itself well to vaping at clubs, bars, at the office (if vaping is allowed), and countless other scenarios where big cloud-making vapes would attract unwanted attention. Vape your JUUL when you want, but break rules at your own risk. My personal favorite pod flavors are the Fruit Medley and Cool Mint among the standard line. The Cool Cucumber and Classic Tobacco are the two I prefer the most from the new limited edition pods. It’s difficult to describe the taste of the flavors, but they’re all fairly accurate for what they’re supposed to be. Unlike a lot of normal ejuice flavors, these flavors are not overly sweet either. That makes them easier to enjoy no matter the time of day. Tip: I suggest trying the JUUL starter kit since it allows you to try four of their flavors. The JUUL is mess free! You won’t have to worry about leaking or spilling any eliquid. As I will discuss later in the tips and tricks section (located after the verdict), the JUUL pods and battery have evolved over time. In the earlier versions, the pods had issues with leaking. That has all been fixed now. The mouthpiece now has cotton pads that prevent liquid from entering the mouth, and the bottom of the pods resist leakage from the battery connection. The JUUL battery is only 200 mAh which means it will need frequent charges. Heavier usage may require one or two charges per day. The small size of the device can only accommodate a low-capacity battery. That said, there are pod devices with larger batteries, but the JUUL seems to last longer than many of them. It’s just more efficient across the board. Again, this comes down to the innovative tech and chip the JUUL uses. Luckily, there are aftermarketJUUL charge cases that will allow you to charge your JUUL on the go so you won’t be tethered to a USB outlet. The JUUL comes with a one-year warranty and their customer support has a solid reputation. Read on any vape forum or social media platform and see customers’ feedback of JUUL support is quite positive. That said, I have not had to use it in the three years I’ve been a JUUL user. Original Granola Bar by Yogi is by far one of the most genuine flavored e liquids that we have tried. It is amazing how spot on it is. With every hit you will get the sensation that you are chewing on an actual granola bar. Yogi E Liquid does a lot to make sure their e juices taste great and perform well out of any device you choose to put them in. They make all of their e juice here in the USA in an IOS7-Certified Lab. They use top of the line 100% Kosher Nicotine in all of their products, and you can really taste their superior quality. Granola Bar by Yogi E Liquids has a pleasant inhale where you will taste flavor notes of nuts, grains, and oats. As the vapor lingers on your taste pallet you will notice a light and sweet honey flavoring that lasts throughout the exhale. Granola Bar by Yogi E Liquids has a strong and delightful aftertaste that will have you licking your lips in pure flavor bliss. The delicious and realistic flavoring is complimented by a smooth and full throat hit. The throat hit is not harsh, nor overbearing. It leaves no burning, charring, or tickling sensation on the back of your throat. From start to finish, inhale to exhale, you get a hit full of luscious vapor that goes down perfectly. Granola Bar by Yogi E Liquid was masterfully crafted with max VG making it great for dripping. We made sure to test it out of both a tank and dripper RDA and it performed outstandingly well out of both devices. This vape juice comes packaged in an awesome cardboard style box with the brands logo on it. The brand logo is a cute looking bear in a hat and button down shirt. The brand name, Yogi, is written clearly across the front of the box with the flavor name, Granola Bar, written across the bottom. The e juice itself comes in a 60ML plastic unicorn bottle. We carry Granola Bar by Yogi E Liquids in 0MG, 3MG, and 6MG nicotine levels. Yogi is probably one of the only brands that tried their hand at the granola bar flavor profile. We think they did an awesome job and nailed it spot on. Grab a bottle today and enjoy this stellar vape liquid! Burst E-Liquid is the newest fruit sensation offering the following flavors: Sher-Burst, Straw-Burst, Citrus-Burst, Melon-Burst and Berry-Burst. Burst also is available in Burst Duo – the combination of two fruits into one flavors: Apple Watermelon and Kiwi Strawberry. The unique fruit flavors are inspired by the pursuit of excellent taste. Crafted with the highest ingredients and flavors that will leave you craving for more! Sher-Burst e-juice by Burst E-Liquid, is a creamy flavor of rainbow sherbet ice cream. A classic ice cream shop favorite, Sher-Burst delivers a fruity sensation of citrus and cream rolled into a summertime dessert. Burst Sher-Burst e-juice provides a tangy inhale of lemon, orange and raspberry with a delicate cream on the exhale. Straw-Burst e-juice by Burst E-Liquid, is the flavor of a juicy pink strawberry mixed into a mouth-watering piece of candy. It’s the delightful enjoyment of everyone’s favorite pink chewy strawberry candy in e-liquid form. Burst Straw-Burst e-juice provides a succulent strawberry chewy candy from the inhale to the exhale. Citrus Burst e-juice by Burst E-Liquid, is a blend of citrus and sherbet. Tangy, sweet and creamy, Citrus Burst is mixture of lemon-lime with creamy ice cream. The refreshing flavor is the perfect choice to cool off during the warm summer nights. Burst E-Liquid Citrus Burst e-juice provides a combination of lemon with a hint of lime on the inhale with a lush of cream on the exhale. Melon Burst e-juice by Burst E-Liquid, is a blend of cantaloupe and honeydew melon. The melon combination of ripe cantaloupe and refreshing honeydew melon, provides summertime delight you will enjoy all day. Burst Melon e-juice delivers sweet cantaloupe on the inhale with juicy honeydew melon on the exhale. Berry Burst e-juice by Burst E-Liquid, is a blend of fresh assorted berries. It’s a handful of the freshest berries – raspberries, blueberries, and blackberries blended together to give you just enough sweetness and tang in one e-liquid. Burst Berry e-juice provides a blueberry on the inhale with both raspberries and blackberries on the exhale. Apple Watermelon e-juice by Burst E-Liquid, is a perfect duo of red apple and juicy watermelon. The unique combination of crisp apples with juicy watermelon the summertime classic you will love in your vape. Burst Duo Apple Watermelon provides a ripe apple on the inhale with refreshing watermelon on the exhale. Kiwi Strawberry e-juice by Burst E-Liquid, is a perfect duo of fresh strawberries and sweet kiwis. The classic combination of sun-kissed strawberries with a hint of tangy kiwis, is the perfect fruit flavor you will continue to enjoy. Burst Duo Kiwi Strawberry e-juice provides a sweet strawberries on the inhale with subtle notes of tangy kiwi on the exhale.